After thinking about the features that should be found in an ideal commuting bike, I set out to find one for myself! It is not easy to find a bike that has all the features listed. 1) Aluminium bike frame to prevent rusting. 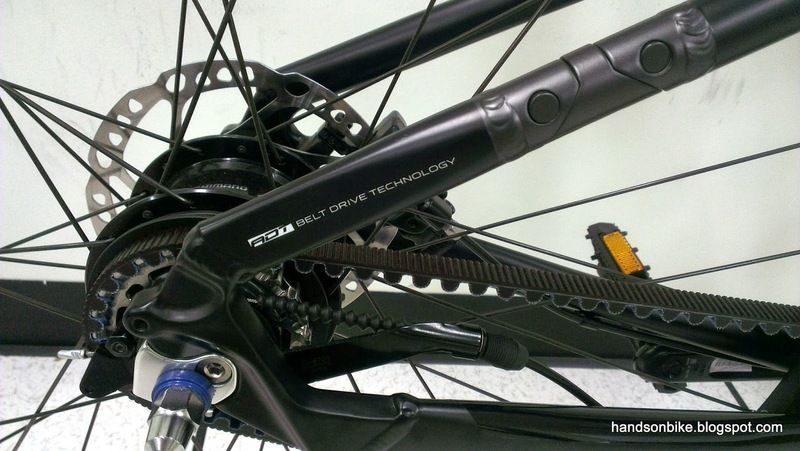 2) Hydraulic disc brakes to avoid dirty brake pads and rims. Works well in the wet too. 3) Internal hub gear to avoid cleaning the RD and cassette. Single speed is not for me, as I like to pedal at a comfortable and optimum cadence, which cannot be achieved if there is undulating terrain. 4) Belt drive system, to avoid chain cleaning, chain lubrication and rusty chains. 5) Frame mounts for fenders and rear rack. There are many bikes out there that can fulfill most of the criteria, except for the one about the belt drive. It is rare to see a belt drive bike in Singapore. Nevertheless, I asked around to see if anyone has any idea where to find a bike with these features in Singapore. These 3 bikes has all the required features, the problem now is whether they are available locally? I heard that the Focus Planet TR 1.0 is currently not in stock and that means one option down. 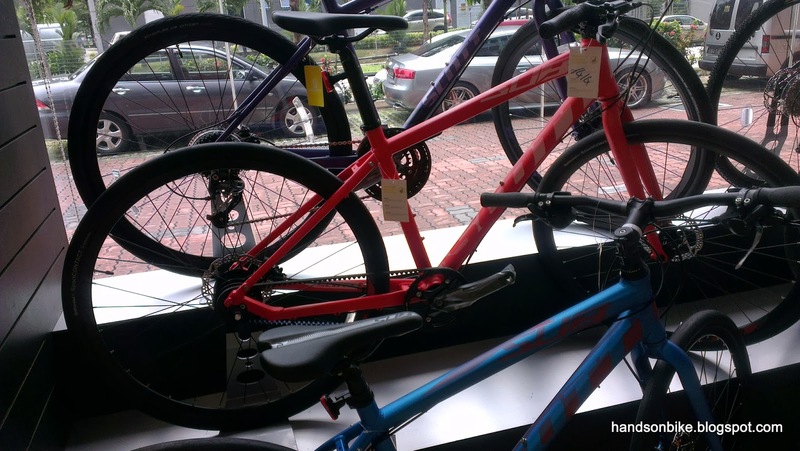 The Scott Sub 10 can be found at Kian Hong Cycle at Vertex, and I went there to check out the bike. I was pleasantly surprised to find that they had a new model in store! The 2013 Scott Sub 10 with Alfine 8 and a Gates belt drive system. The price was SGD 1599, which was a reasonable price. The new colour was outstanding too. However, I was unable to test out the bike as the road was wet after rain. Keeping the Scott Sub 10 in mind, I went to check out the next bike: The Avanti Inc 2 or 3 (unsure at this point) was available at BikePlus, Midview City. 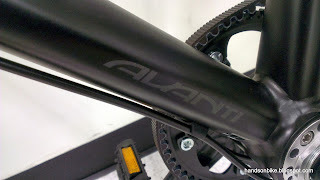 When I reached BikePlus, I immediately asked about the Avanti Inc and found that the only one left in store is the Avanti Inc 3. As such, it was available for a good deal at SGD 1799 (Original 2399). This bike is equipped with Alfine 11 and the latest Gates CDX CenterTrack belt drive system. It also comes with Shimano hydraulic disc brakes and hubs. After riding two rounds around the car park, I decided to get the bike! Yusri from BikePlus was also very kind to send the bike to my place at no additional cost. With that, let me introduce the latest addition to my bike stable, the Avanti Inc 3! Refer to the link for the full specifications. 2) Hydraulic disc brakes - Yes. Shimano BL-M445 and BR-M446. Bike is full matte black for stealth commuting! Hides dirt well too. 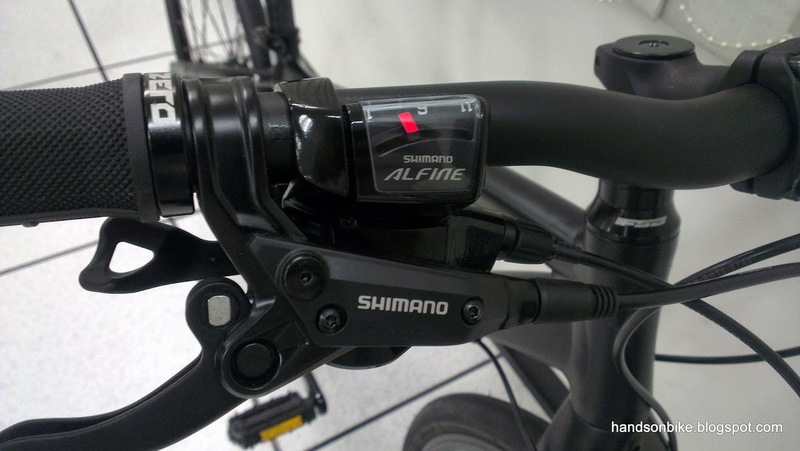 Comes with Alfine 11 shifters (Two-way release, Multi-release) which have a similar top normal design as MTB Rapidfire shifters. Mid-range Shimano hydraulic brake levers BL-M445. Shimano Alfine 11 internal gear hub! Yup it is 11 speeds. More than enough for commuting. Yet another view of the Alfine 11 internal gear hub. Note the oil port for easy oil replacement. 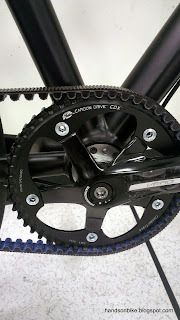 Gates CDX CenterTrack Carbon Belt Drive system! Shown here is the front pulley of 50 teeth. Rear pulley of 24 teeth. The yellow markings should be aligned at Gear 6. Also note the split in the rear triangle, at the seatstay area. 2 bolts at the bottom of the seatstay split allows the joint to be opened or closed for belt installation. Small sized frame. According to the Avanti website I am in-between Small and Medium for this frame. 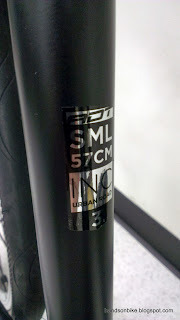 The 57 cm refers to the horizontal top tube length (distance from stem to seatpost). 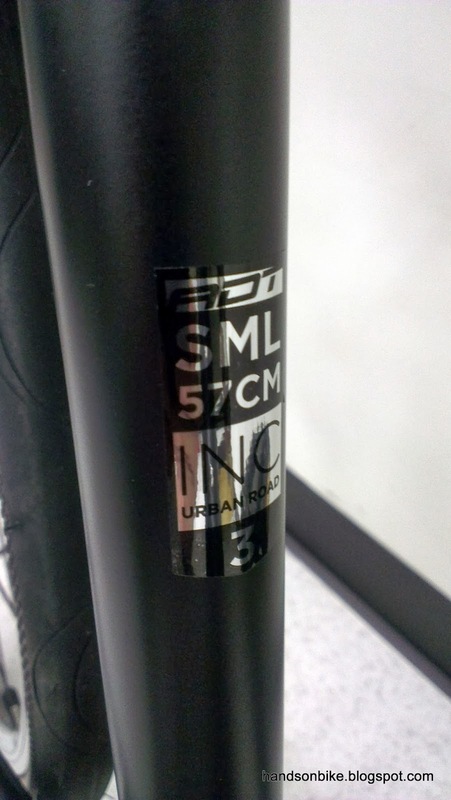 Even the brand logo is placed subtly near the bottom of the downtube, instead of being splashed across the frame. Love the stealthy look! 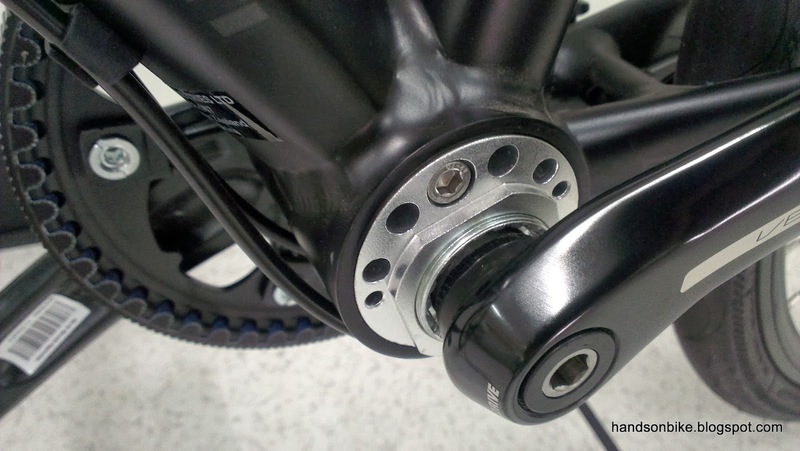 Eccentric bottom bracket for chain tensioning. Have not figured out how to adjust this eccentric BB yet. 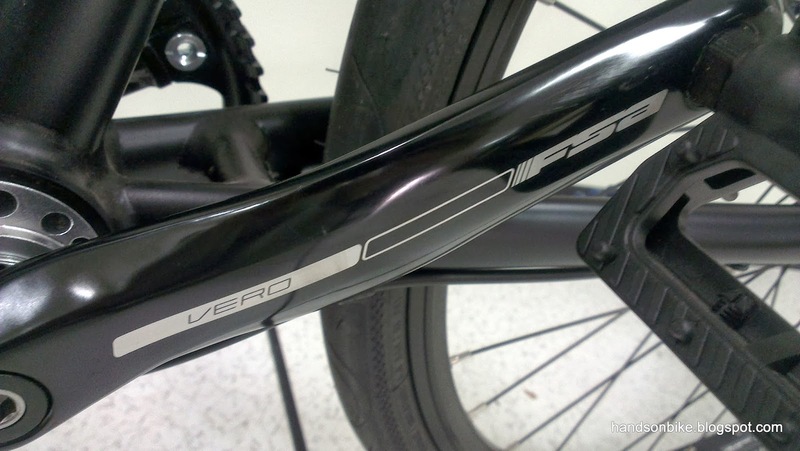 OK quality FSA Vero crankset. 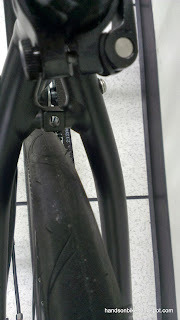 But I find that the crankarms flex too easily, and I will change them out soon. Same for the cheap plastic pedals. Shimano hydraulic brake calipers BR-M446, with Shimano hub, QR and Centrelock rotors. 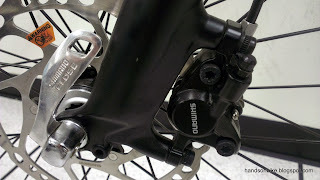 View of the rear brake caliper. Neatly hidden inside the rear triangle, which means that normal rear racks can be used, instead of needing disc brake specific rear racks. Mounting on the front fork for fenders. Good clearance to fit in the fenders. 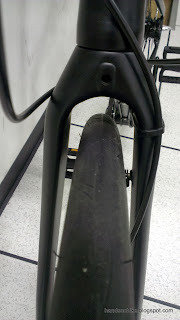 Clearance between rear tire and the rear seatstay bridge. Also note the mounting point for the rear rack. Continental SportContact tires. 700x37C (37-622) tire size. Rim dimensions. 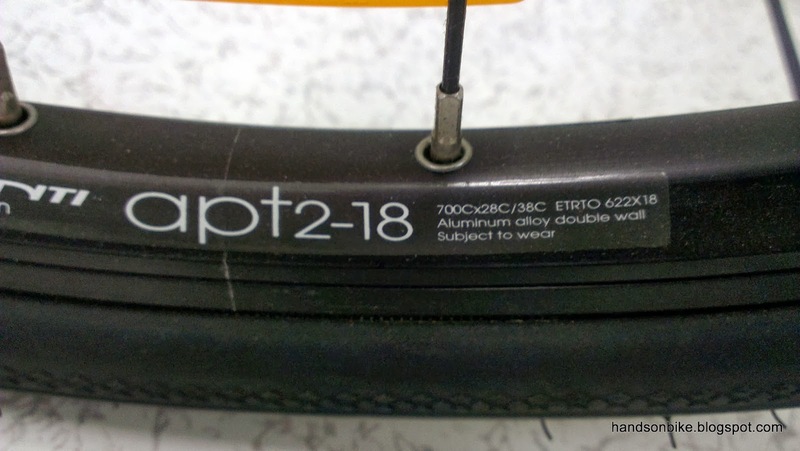 Recommended tire width is between 28 to 38mm. 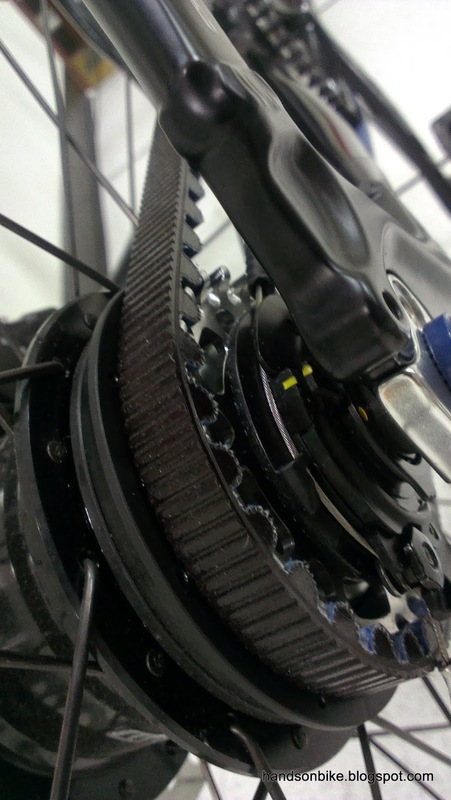 With a belt drive system, I no longer have to clean and lubricate the chain regularly, even after wet rides! The belt performs best when washed clean, so it actually cleans itself automatically when you ride through a puddle. What is really nice is that this is the newest CDX belt system, instead of the older and more problem-prone CDC. No more rusty chains! The internal gear hub is also quite impervious to wet conditions, as long as I don't submerge the whole bike in water. The only maintenance I need is probably to adjust the shifter cable tension occasionally, or to replace it if it rusts. Might need to replace the oil in the internal hub after 1000km. No more rusty/dirty RD, FD or cassette! 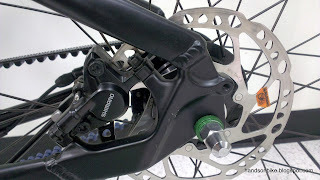 I also like the hydraulic brake system, which retains its braking performance even in wet weather. No more cleaning of brake pads and rims! 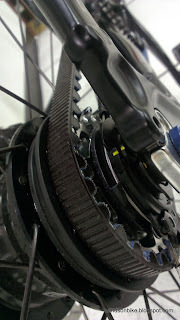 Of course, this internal gear hub + belt drive is not all advantages and no disadvantages. The major disadvantage (and probably the only significant one) is the additional weight over a standard mechanical drivetrain. The actual weight will differ based on your actual setup, but this is the estimated weight of these 2 different setups. 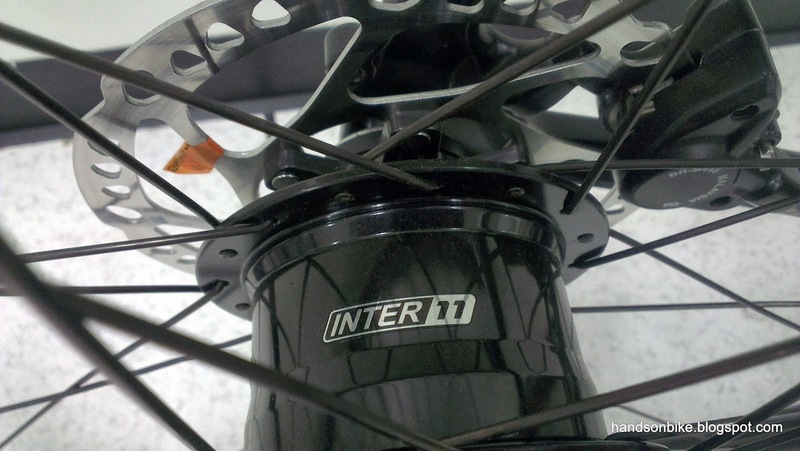 In summary, the internal hub gear system will be heavier than an equivalent 2x10 speed system by about 500 grams. Why do I say equivalent? This is because I am comparing these two setups based on equivalent gear range. You may be surprised, but the Alfine 11 gear range is actually comparable to a 2x10 drivetrain on a road bike. Although there are 20 speeds in a 2x10 speed system, there are actually many overlapping gears, which reduces the actual number of unique gears available. On the other hand, the Alfine 11 has 11 different gear ratios that don't overlap. Gearing comparison between Alfine 11 and compact 2x10 road system. For the Alfine 11 system, I used the gear ratios as found on my Avanti Inc 3. As for the 2x10 road bike, I used a compact crankset (50/34T) as it is more realistic. A top gear of 53/11T on a standard crankset is normally only used by the professional cyclists while going downhill. As such, I used a compact crank of 50/34 and a cassette of 11-28T for comparison. Notice that the gear range for these two systems are actually very similar. 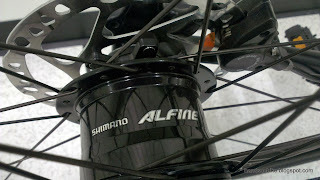 The Alfine 11 is pretty impressive as it can match the lowest and highest gears of a compact 2x10 road bike drivetrain! As for the gears in the middle, just match the colours to find the matching gears between the two systems. You can see that the Alfine 11 gearing pretty much covers the gearing provided by the 10 speed cassette, save for a couple of bigger jumps at the higher end of the gear range. I am now waiting for the add-on accessories (fenders, rear rack, lights, etc) to go on the bike, before it is put into proper service. Will report on the ride quality and other riding feedback in the next few blog posts! What is the weight of the bike as you got it? I've just seen these available in the UK & they look very good. I was looking at the Focus TR1.0 this summer but was put off by the CDC belt. Apparently for 2014 they are changing the belt to one with mud ports (hollow toothed gear rings) so dirt does not build up around the face of the cog flange, something that should not be a problem for the CDX. 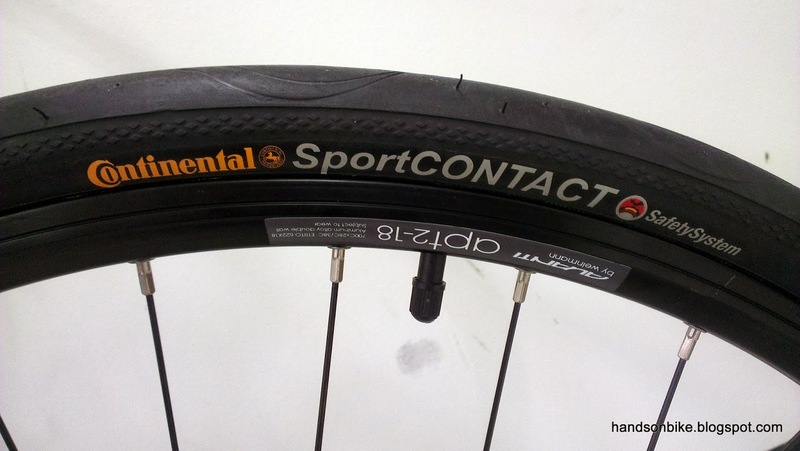 Whilst going on about belt drive bikes, Continental are also doing a system with deeper teeth profiles, that apparently would skip less & require less tension, so less strain on the bearings. All that said I think I might treat myself to an Avanti Inc 3.0. I didn't weigh the bike, but it should be around 11 kg. You should be able to find the info online. You might think so but I have not seen it mentioned anywhere. Currently in the UK I have yet to find any in stock, I presume it is the crossover time for the 2014 models. how much is this bicycle? 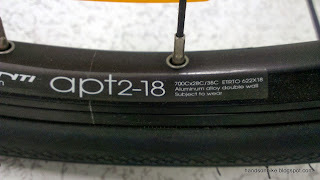 bought from bikeplus? I bought the last unit from BikePlus at $1799. 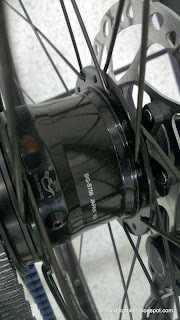 I bought my Avanti Inc 3 yesterday to replace my Giant Seek 0 2013. The Giant was a reliable bike but had numerous small things like harder tyres which make for a bumpy ride and 170ml cranks (on an XL is way too short for tall ppl like me). The Alfine 8 I also don't believe cuts it for a bike in XL size. Down hill time became waiting time. Even though i've only done 10kms since getting my Inc 3 it was the bike i should have bought a year ago. 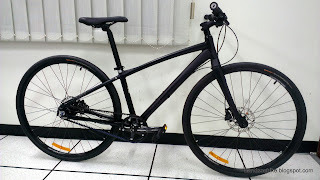 A few things i really appreciate since getting it are the SportContact tyres, the much lighter frame and the smoothness and quietness of the Gate belt drive and of course the Alfine 11. The 11 makes all the difference. I couldn't recommend it more to spend the extra dollars and get an 11 instead of an 8. Would recommend to anyone commuting ~20kms each day. The price has dropped to around $1,500 at Avanti Plus now. Had Brunswick price match Fitzroy Cycles for me. Hi all ! 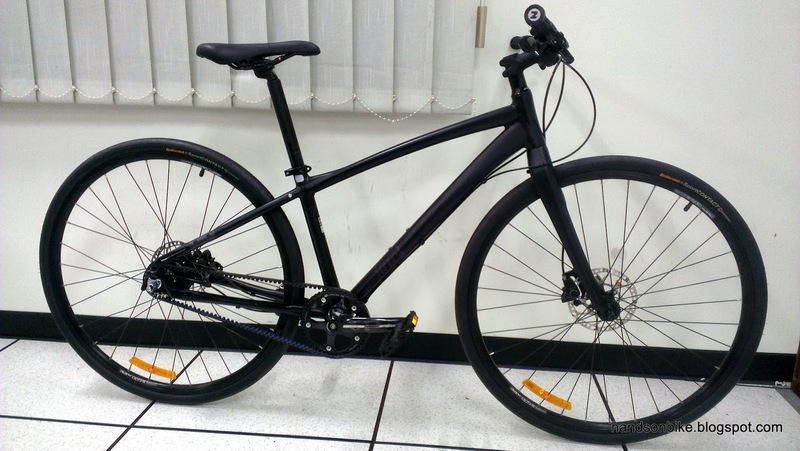 I am looking everywhere after this bike ,2014 model in L size,but so far nothing. Anyone here know where to purchase Avanti inc 3.0 L size in the EU.Btw. it would be nice with some price discount .... is there any significant difference between 2013 and 2014 model ?? Hi. I would also be interested in finding this bike available in Europe, preferably with frame sizes M or L. Any hints? You have to look for an Avanti distributor over there. 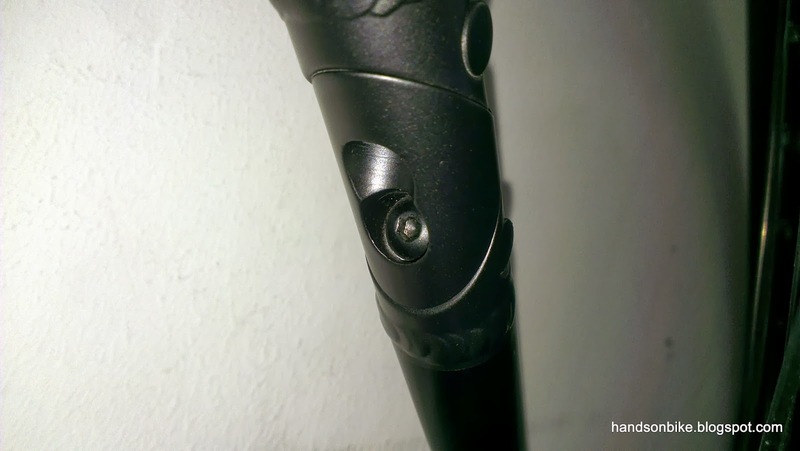 Hi, were you able to change the crank arms of your bike? I wonder what was your replacement. I bought this Scott Sub 10 belt drive bike, and planning to replace the crank arm too. Any recommendation? appreciate. it. You need to measure the BB width on your frame, to see if it is 68mm or 73mm. If 68mm, get a road crankset to replace. 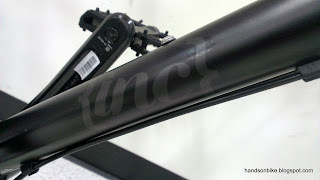 If 73mm, get MTB crankset. 1000km! I do that in a month or less. If I wanted to deal with constant oil changes, I'd buy a car. The recommended first oil change is after 1000 km. After that, it's every 5000 km. Do you use this Avanti more often or the Merida Scultura 5000? My worries is not many people carries Avanti hence difficult to find spare parts and people know how to service if needed. Currently I ride the Avanti more often as it is the rainy season. Bike Plus carries the Avanti brand in Singapore and they can service the belt drive bike.